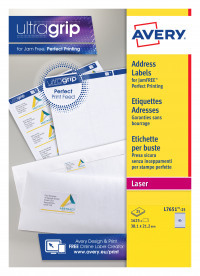 • Ideal for return addressing and organising your documents. • Find items faster - use these labels to mark the contents of your files, folders and boxes. • Use for return addressing and your post won't get lost but returned to sender. • Save time with free Avery® templates and software for Microsoft® Office - easy to download, easy to use. • Eco friendly: can be fully recycled as part of paper waste. • FSC certified - made from paper from well managed sources. Avery mini labels are specially design for your laser printer. They can be peeled away from the sheet easily with QuickPEEL technology by tearing down the perforated divide or removing them from the sheet in one swift motion. Avery's free template software creates personalised and custom labels. JamFree technology ensures uninterrupted production. You can use with environmental confidence as these labels are fully recyclable to ensure eco-friendly practices.